2 drawings on paper, laminated (1 sheet) : ink ; left image 3.875 x 3.125 x in., right image 4 x 2.75 in., on sheet 6 x 9.5 in. 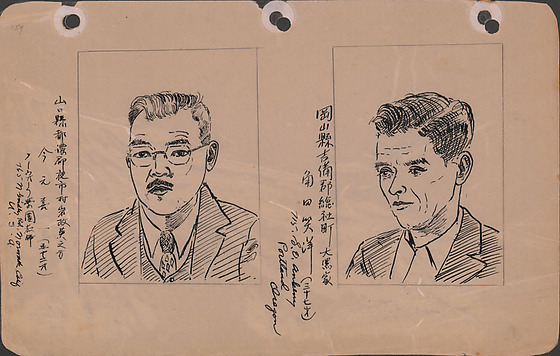 Ink portraits of two men, Zemichi Imamoto and Shoyo Kadota, at Lordsburg Justice Department Camp, New Mexico. Both drawings have pencil line borders. Left portrait of Zemichi Imamoto, 52 year-old school teacher at Norwalk Gakuen in California, originally from Yamaguchi, Japan. Imamoto faces the viewer in a dark three-piece suit with a diamond patterned tie. He gazes a viewer through hexagonal rimmed glasses. He has a mustache. Visible from shoulders up. Right portrait of Shoyo Kadota, 37 year-old Portland, Oregon resident, originally from Okayama, Japan. Kadota is turned to the left with head slightly inclined. He is dressed in a dark jacket over a button-down shirt. His full hair is parted on the proper left above his narrow face. Visible from shoulders up. Written in black ink to left of left image (In Japanese and English): Yamaguchiken Isumogun Yaichimura Iwamasa Hideyakikata / Imamoto Zemichi (52 sai) / Nouaku Gakuen kyoshi / 765 N [unreadable] Rd, Norwalk, CAlif. / U.S.A. Written in black ink to left of right image (In Japanese and English): Okayamaken Kibigun Soshiamachi Oguroke Kadota Shoyo (37) / 715 S.E. [Anbeny] / Portland / Oregon. Written in pencil, top left corner: 159.